Complication rates associated with thyroid surgery can be evaluated only through analysis of case studies and follow-up data. 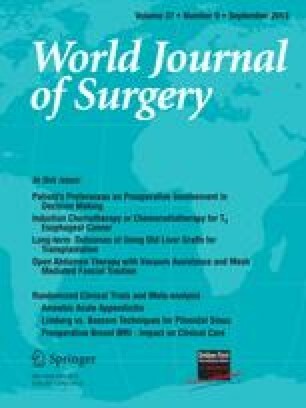 This study covers postoperative data from 14,934 patients subjected to a follow-up of 5 years. Among them, 3130 (20.9%) underwent total lobectomy (TL), 9599 (64.3%) total thyroidectomy (TT), 1448 (9.7%) subtotal thyroidectomy with a monolateral remnant (MRST), and 757 (5.1%) subtotal thyroidectomy with bilateral remnants (BRST). A total of 6% of the patients had already been operated on. Persistent hypoparathyroidism occurred after 1.7% of all the operations, and temporary hypoparathyroidism was noted in 8.3%. Permanent palsy of the laryngeal recurrent nerve (LRN) occurred in 1.0% of patients, transient palsy in 2.0%, and diplegia in 0.4%. The superior laryngeal nerve was damaged in 3.7%; dysphagia occurred in 1.4% of cases, hemorrhage in 1.2%, and wound infection in 0.3%. No deaths were reported. A significant rate of LRN damage was noted, which has an important impact on the patient’s social life. Hypoparathyroidism after total thyroidectomy is an important complication that can be successfully treated by therapy, although it is not always easily managed in special circumstances such as in young persons or pregnant women. The complications associated with thyroid surgery must be kept in mind so the surgeon can carefully evaluate the surgical and medical therapeutic options, have more precise surgical indications, and be able to give the patient adequate information. We thank the multicentric study members of the CLUB delle U.E.C. (Association of the Endocrine Surgical Italian Units): A. Ambrosi (Endocrine Surgical Unit, University of Foggia); A. Arlandini (Galliera Hospital Genova); N. Avenia (Endocrine Surgical Unit, University of Perugia); A. Bastagli (Endocrine Surgical Unit, University of Milano); A. Battilana (S. Giuseppe Hospital Milano); R. Bellantone (Endocrine Surgical Unit, University Catholic of Roma); G. Biliotti (Endocrine Surgical Unit, University of Firenze); D. Borrelli and I. Paulin (Careggi Hospital Firenze); F.P. Campana (Endocrine Surgical Unit, University of Roma); A.M. Cannizzaro (Endocrine Surgical Unit, University of Catania); F. Caruso (Cancer Institute Catania); A. Ciccolo (Endocrine Surgical Unit, University of Messina); M. D’Ajello (Hospital of Foligno); N. D’Alessandro (S. carlo Hospital Potenza); S. De Fina (Endocrine Surgical Unit, University of Monza); U. De Nobili (Endocrine Surgical Unit, University of Brescia); M. De Palma (Cardarelli Hospital Napoli); A. Di Roma (Hospital of Carmagnola); S. Faragona (Umberto I Hospital Ancona); G. Fattovich and G. Trentini (Hospital of Verona); G. Gasparri (Endocrine Surgical Unit, University of Torino); R. Lampugnani (Hospital of Fiorenzuola D’Arda); E. Longo (Tappeiner Hospital Merano); D. Marrano and M. Taffurelli (Endocrine Surgical Unit, University of Bologna); E. Melchiorri (Hospital of Tolentino); G. Melotti, M. Piccoli, and M.G. Lazzaretti (S. Agostino Hospital Modena); F. Mento (Barone Romeo Hospital Patti); A. Mussa and M. Deandrea (Endocrine Surgical Unit, University of Torino); P.G. Nasi (Mauriziano Hospital Torino); U. Parmeggiani (Endocrine Surgical Unit, University of Napoli); E. Passeri (Hospital of Gubbio); M.R. Pelizzo (Endocrine Surgical Unit, University of Padova); P. Petrillo (Rummo Hospital Benevento); L. Pezzullo (Cancer Institute Napoli); C. Pietrantuono (Cardarelli Hospital Campobasso); R. Pugliese and M. Boniardi (Niguarda Ca’ Granda Hospital Milano); A. Robecchi and N. Palestini (Endocrine Surgical Unit, University of Torino); M. Romano (Endocrine Surgical Unit, University of Palermo); L. Rosato (Hospital of Ivrea); M. Sianese (Endocrine Surgical Unit, University of Parma); S. Spiezia (Incurabili Hospital Napoli); G. Trombatore (Hospital of Lentini).